Quality, service, and speed; these are the three things you get when you buy Centric Inc. made grinding templates. Our well-qualified staff will work with you to design a template to match any existing product or drawing. Centric Inc. is proud that templates are normally designed, cut, etched and shipped in the same day. Our staffs extensive knowledge and experience together with in-house EDM wire cutter, CNC router, and laser etcher is how Centric Inc. can design, cut, etch and ship templates all in one day. We can also answer any questions you might have about the template design and how to get the best cut and end product. Centric Inc. offers a verity of template materials to accommodate any preference or requirement. Template materials include acrylic plastic, pre-hardened stainless steel, and hardened D2 steel. Centric Inc. template (unless specified) are calculated with a 20mm axial constant for our customers convenience. The 20mm axial constant keeps the distance from the moulder fence to the wood material consistent between all profiles and projects. Axial constants reduce the set up times required from the grinding room to the moulder. Axial constants speed up the set up time because it keeps the distance from fence to start of wood consistent throughout all profiles and set ups. Manufacturers like Weinig, Cantek, and Leadermac all recommend that operators use a 20mm/60mm axial constant to ensure accuracy and ease of production. Foley/SCM recommends a 20mm/1.75” axial constant due to the layout of Foley/SCM profile grinders. Centric Inc. templates are accurate up to 0.0001” of an inch; we are able to achieve this impressive level of accuracy thanks to our expert staff and in house EDM wire cutter and CNC equipment. Centric Inc. can also personalize your templates with our laser etcher by adding text, part numbers, and simple logos. The staff at Centric Inc. has the experience and knowledge to turn your ideas into reality. Centric Inc. can create a template based off DXF file, drawing/sketch, wood sample, and/or verbal/written instructions. However you send your profile design to Centric Inc. we will create a DXF file/drawing for your approval. If there is a problem with how the profiled knives are running in your moulder Centric Inc. will work with you to troubleshoot the problem and make recommendations to ensure you get the best run possible with a quality finished product. Customers that get their templates from Centric Inc. know what they are getting; quality, service and speed. Templates are designed and cut to our customer’s exact instructions and typically ship the same day as ordered. In the last 5 years Centric Inc. has designed, cut, and shipped out nearly 3000 acrylic and steel grinding templates to customers all across the United States. 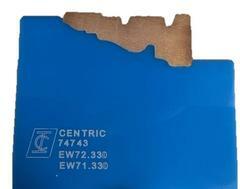 Contact Centric Inc. today and ask about a free quote on a template or any other of the many products we offer at Centric Inc.
For more information please contact Centric Inc. via phone at 715-848-4242 or email us at info@Centrictool.com. You can also find us on the web at www.Centrictool.com and coming soon in 2018 Centric Inc. is proud to announce our new eCommerce online store.